GENERAL SANTOS CITY – Manny Pacquiao went through an angiogram to determine whether he is suffering from any heart problem less than a week before his fight against Argentinian slugger Lucas Matthysse. Unknown to many, Pacquiao was rushed to Cardinal Santos Memorial Hospital in Manila around 3:00 p.m. on July 8 after he complained about difficulty in breathing several times during the duration of his preparation for the July 15 Matthysse fight. Nobody knew about this – not even a single member of his training team or immediate members of his family. He didn’t want any member of his family to worry, the reason why he kept it to himself. Jinkee and their children travelled to Malaysia via Singapore a week ahead of Team Pacquiao. An angiogram is a test used to detect heart problems. During the procedure, a long and thin flexible tube called a catheter was inserted into Pacquiao’s wrist all the way up to his heart. A dye was injected and x-ray pictures were taken. Based on medical information, the special dye allows the X-rays to capture pictures of coronary arteries and highlights where the clogs or narrowed spots may be located. Pacquiao together with about four or five members of his inner circle accompanied him to Cardinal Santos Memorial Hospital in Manila around 3:00 p.m. on July 8 to undergo an angiogram. 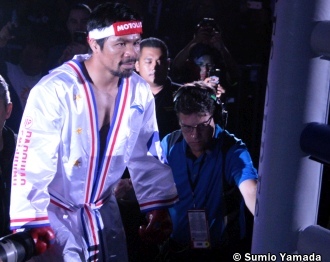 Team Pacquiao flew out to Kuala Lumpur, Malasyia, around 3:00 p.m. on July 9. “I was required to run on a thread mill then an ECG was conducted. The result was quite amazing. The result showed that my heart rate and rhythm improve as my physical activity increases,” Pacquiao bared. The electrocardiogram (ECG) is a diagnostic tool used to assess the electrical and muscular functions of the heart. “The entire medical procedure was finished around 3:00 a.m. on July and at around 7:00 a.m., we flew back to General Santos. Those who were with me were saddened and crying. But I told them, don’t worry, I’ll be okay and I’ll do everything to win the fight,” Pacquiao claimed. According to Pacquiao, he did not inform the members of his training team beforehand to avoid demoralization. Head trainer Buboy Fernandez learned about it only after Pacquiao’s visit to Cardinal Santos hospital. “Buboy cried hard upon learning what happened. But I told him to stay strong and continue what he was doing. God will take care of the rest,” Pacquiao said. Pacquiao did not train a day after arriving in Kuala Lumpur. Only the following day, a Wednesday, when he jogged around the Kuala Lumpur Botanical Garden then trained at the pop-up gym inside the Le Meridien Hotel. Once again, Pacquiao showed his toughness and selflessness – risking his life to fulfill his mission which is to unite and make his countrymen proud and happy even momentarily. Yet, there are some, particularly his critics and political detractors, who continue to bash and berate him despite his sacrifices and heroism. Take for example the case of an ingrate Eric John Salut, publicist of a giant TV network, whose insolence and boorishness is beyond compare. Salut knows nothing about the real Manny Pacquiao. His bravado is appalling as if he is a sage sitting on a mountain knowledge. This guy has done nothing to make this country proud? Salut lived up to his name. He’s a pest, a disgrace to the TV network which earned millions of pesos out of Pacquiao’s toils and sacrifices. Pacquiao’s Maharlika Pilipinas Basketball League (MPBL) paid more than P20 million to ABS-CBN Sports & Action for the coverage of the league’s inaugural season tournament earlier this year. Is this how an ABS-CBN publicist behave towards the network’s valued client? If I were Pacquiao, I will direct my lawyer to terminate MPBL contract with ABS-CBN Sports & Action and find other TV network whose people knew the meaning of the word RESPECT. Photo: Manny Pacquiao climbs the ring for his world championship fight against Lucas Matthysse of Argentina on Sunday, July 15, at the Axiata Arena in Kuala Lumpur, Malaysia.